Mexico City – Last week, Mexican President Felipe Calderon gave the fifth state of the nation speech since his (many say fraudulent) election in 2006. He didn’t have an easy time finding a positive spin for the escalating toll exacted by his war on drug gangs – 50,000 dead, mostly innocent civilians, in the last five years. Making his job even more difficult, just days earlier, the war’s bloody cost was highlighted when 52 people, mostly working women and retirees on their lunch hour, were burned to death in a fire set by the Zetas in a Monterrey casino. Since then, Mexican newspapers have exposed a web of corruption linking businessmen, narcos and politicians from Calderon’s own party in the enormous proliferation of gambling houses over the last several years. Mexican casinos don’t attract the wealthy, who congregate instead in Mexico City’s rich neighborhoods, filled with glittering restaurants and shiny Hummers, patrolled by bodyguards to prevent the frequent kidnappings. Casinos are the refuge of Mexico’s working poor, who hope a miracle of luck will pull them from the abyss of falling incomes and disappearing jobs. The SME has been occupying over half the huge square at the city’s heart since May, and they’ve been at war with Calderon since the government fired the union’s 44,000 members in October of 2009. The national company that employed them, the Power and Light Company, provided electrical service for central Mexico, where a majority of the population live. Calderon dissolved it by executive fiat and brought in soldiers and police to expel the workers from the generating stations. Successive governments have sought to privatize the electrical grid, although such a move is barred by the Mexican constitution. The union repeatedly mobilized the opposition of hundreds of thousands of city residents and prevented it, at least until that October. Once the company was dissolved, the government declared the union nonexistent (a decision later overturned by the courts, but ignored by Calderon). Over the last two years, this fight over the privatization of electricity and the smashing of one of Mexico’s oldest and most democratic unions, has become a symbol of the administration’s war on unions. Protesters fill the zocalo, listening to speakers condemn the government. 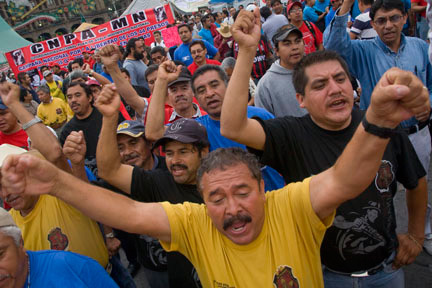 Other unions have also felt the government’s wrath and came to protest in the zocalo. One was the Mexican miners’ union. In Cananea, a tiny mountain town south of Arizona with one of the world’s largest copper mines, miners have been on strike for four years. The mine’s owner, Grupo Mexico, belongs to the Larrea family, political allies of Calderon who contributed heavily to his election. This year, he repaid the debt. In the face of court decisions upholding the workers’ right to strike, the government brought heavily armed police into Cananea and reopened the struck mine. Hundreds of ex-employees of the country’s national airline, Mexicana, joined miners and electrical workers as they marched into the zocalo. This year, the administration forced the company into bankruptcy and thousands of pilots, stewards and ground crew members suddenly found themselves out on the street. Their union charges that the bankruptcy was a sham. Instead, they say, Calderon’s cronies stood to gain from the airline’s eventual privatization. Meanwhile, the wealthy families who own Mexico’s mushrooming private airline industry won the removal of their biggest competitor, at the cost of thousands of jobs. Unemployed workers from Mexicana Airlines. The hundred organizations that cooperated in organizing the zocalo protest called their rally the National Day of Indignant Mexicans. Their purpose was to present an alternative to the “official” picture painted by Calderon, and to call for a different direction for the country. They charged that, in five years, the number of Mexicans in poverty has grown by ten million, that working income has dropped by a third and that three million more people find themselves jobless. The crisis has hit especially hard at young people, who are the fastest growing segment of the population. Seven million of them can’t find work and have no money to go to school. Calderon’s policies, which have produced these results, are part of a program of economic liberalization opening Mexico to private, domestic and especially foreign capital. Former Mexico City Mayor Manuel Lopez Obrador, who ran against Calderon five years ago and, most people believe, defeated him, says these reforms have been “imposed on Mexico from outside over the last two decades, including labor law reform, energy reform, fiscal reform and education reform.” By outside, Lopez Obrador means from the colossus of the north – the US. In the wake of the implementation of the North American Free Trade Agreement in 1994, Mexico underwent a terrible economic crisis in which it lost a million jobs in a single year. The Clinton administration bailed out the government and its bondholders and, in the end, Mexico lost its financial system to Wall Street and London banks. Since then, the International Monetary Fund and the World Bank have indirectly written Mexico’s economic policies. Angry farmers protest corn dumping by US companies. “At the same time,” Lopez Obrador charges, “the fight against inequality and poverty is not on the national agenda.” In 2010, Mexico had 53 million people living in poverty, according to the Monterrey Institute of Technology. Half the country’s population lives in poverty and almost 20 percent in extreme poverty. Some estimate that there are more workers in the economy’s informal sector than in the formal one. Even for those working, according to the Bank of Mexico, 95 percent of the 800,000 jobs created in 2010 paid only $10 a day. Yet, in a Tijuana or Juarez supermarket, a gallon of milk can cost even more than it would on the US side. In a recent diplomatic cable published by WikiLeaks, the US government admits, “The net wealth of the 10 richest people in Mexico – a country where more than 40 percent of the population lives in poverty – represents roughly 10 percent of the country’s gross domestic product.” Carlos Slim became the world’s richest man when a previous president, Carlos Salinas de Gortari, privatized the national telephone company and sold it to him. Ricardo Salinas Pliego, who owns TV Azteca, is now worth $8 billion, and Emilio Azcárraga Jean, who owns Televisa, is worth $2.3 billion. Both helped Calderon get elected in 2006. Veterans of Mexico’s social upheaval. This is what the zocalo protesters want to change and why they call themselves “indignant Mexicans.” Next year, in July, that chance will come again, as the country goes to the polls to elect a new president. The Constitution prohibits re-election, but Calderon’s National Action Party will undoubtedly nominate a candidate who will defend the government’s record and call for more of the same. Mexico’s old ruler, the Party of the Institutionalized Revolution (PRI), has the support of many wealthy interests who have abandoned Calderon and is growing stronger after a decade in the political wilderness. It criticizes the president, but in practice, its representatives in the Chamber of Deputies and Senate propose and vote for the same policies. Ismail Lopez, a retired electrical union member. Lopez Obrador has fought with Mexico City’s current Mayor Marcel Ebrard and other factions in the left-wing Party of the Democratic Revolution (PRD) over both his own future candidacy and his insistence on a total rejection of the government’s policies and direction. Every week. he travels back and forth across Mexico, holding rallies in town after town, building a political coalition he insists isn’t a new party, but could be an electoral base for change.